'Applegreen' was originally built for Harry Payne Whitney and his wife Gertrude Vanderbilt Whitney by Stanford White. When they moved into 'The Manse', the William C. Whitney house, H.P. 's younger sister Dorothy and her husband Willard Straight moved in. 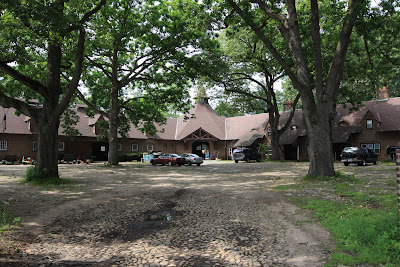 Delano & Aldrich did alterations to the main house (c. 1912), which had a wing demolished but still survives as a private residence, as well as designing the stables which are part of the Old Westbury Country Club today. Click HERE to see the 'Applegreen' stables on google earth. Click HERE to see 'Applegreen' itself on google earth.